Relative value of large cap volatility. We all track the VIX as a measure of volatility, but we often forget that the VIX is volatility indicator for the large cap index within the SP500. We can construct volatility measures of volatility for different sectors/industries (tech, healthcare, financial, etc.). There is volatility on size mid-cap indices, small cap. One thing that caught my eye the other day was the volatility on the Russell 2000, which is the volatility on the small cap indices and which is currently trading at 20, is about 8 points higher than volatility on the VIX, the large cap volatility index. Historically, the VIX has always been 70% of the RVX. Looking at a historical chart of the ratio of VIX:RVX I saw that the ratio tended to increase in major market corrections and tended to approach parity before reversing around. Besides the fact this indicator could be used for market timing, I would like to get many of your takes as to why the volatility expectations on large cap stocks increases faster and reaches the same level as that of small caps. How?? It is clear that small cap stocks are riskier, have a higher beta and are less capitalized than larger firms. This relationship I have described was not a one time instance, it has repeated many times and therefore worth noting here. I appreciate all your feedback. Could it be a result of the fact that stocks get stickier as the market cap decreases? Once the 2008/2009 exploded liquidity dried up in the small and micro-cap arena and bid/ask spreads prevented any trading. This is also a consequence of the fact that in the small-micro-mid cap a larger share of the players have a buy-and-hold style. \$VIX and \$RVX strongly correlated with market action. Therefore, I agree with @SelfTaght line of reasoning to find the differentiating factor. this paper provides some additional information - "Call purchases increase with positive returns and decrease on days with negative returns, while put purchases behave exactly the opposite way. However,both call and put sales increase on days with large positive or negative returns." Leveraged portfolio also add to the decline (sell pressure) due to margin requirements or day trading rules etc. However, The small or micro cap stocks do not benefit from buy and hold. Warren Buffet types, pension funds hold big names, big caps, partly mandated by their charter, which typically have lower volatility. 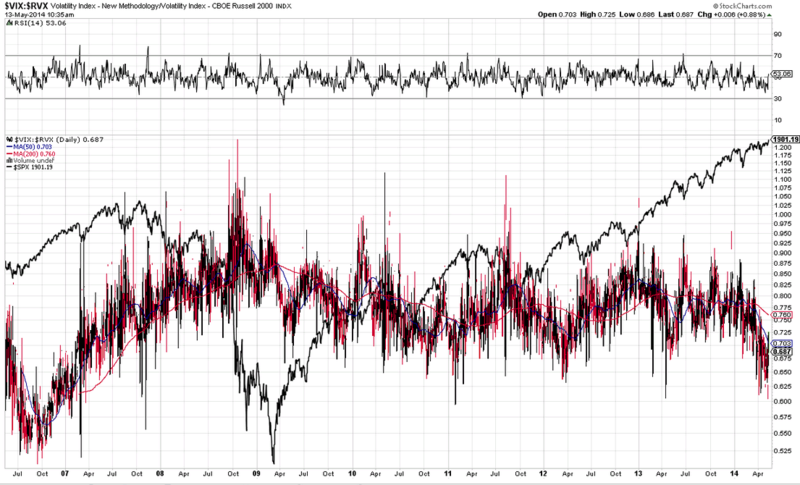 That is why \$RVX is generally larger than \$VIX.